If you are looking for a flooring material that will give you enough design options to choose from while at the same time being great at resisting moisture and easy to care for, congratulations, you have found it! Being created in 1920 by accident, today Vinyl is the most popular type of resilient flooring. Because of its characteristics vinyl is often used where there is a certain danger of liquid spills, like the kitchen and the bathroom. However, with modern advancements in manufacturing technology, it’s become possible to imitate look and texture of all natural materials and to use vinyl flooring pretty much everywhere in the house without a second thought. Vinyl floors come in three different forms, sheet plank and tile. The main difference between them is the shape and the way they are installed. Sheet vinyl is ‘the original’ vinyl flooring. It’s a single roll of vinyl that’s usually between 6 to 12 feet wide. Because of the bigger surface area, sheet vinyl can cover the same amount of space and leave behind fewer seams than a vinyl plank or tile flooring. This makes vinyl sheet even more durable than same material alternatives when it comes to installing the floor in bathrooms and kitchens. Vinyl tile flooring is constructed from smaller individual pieces of vinyl that are shaped like a square. When assembled they give the appearance of a tile flooring. Vinyl tiles come in a wide range of patterns and can imitate natural materials like stone and ceramic tile flooring. The main benefit of installing vinyl floor tiles is that they are easier to replace than any alternative flooring option including sheet vinyl. Having individual pieces make it possible to exchange just the damaged tile, it’s less time consuming and more economical. Most vinyl tiles available on the market today already come with an adhesive backing for a simpler installation.Vinyl tile flooring also gives you the possibility to arrange a unique pattern by mixing different tiles. Vinyl plank floors operate using the same principle as tile vinyl floors. The main difference is their shape. Vinyl plank flooring is designed to make your floor look like hardwood without you having to pay nearly as much. Just like with every other flooring option trying to imitate real wood flooring, some vinyl planks look more like the real thing than others. However, all of them provide more stain resistance and durability than traditional hardwood floors. Vinyl flooring comes in 2 forms, sheet and tile. The most prominent difference between the two being the installation method. Vinyl flooring is comprised of 3 components, a felt paper backing on the bottom, a layer of vinyl foam in the middle, on which the design is printed and a layer of transparent vinyl on the top to protect from wear. To create texture an inhibitor is used in certain parts of the foam so they won’t expand. The foam itself is made from a mixture of powder and liquid ingredients. Powder ingredients are PVC, white pigment and calcium carbonate, which is mostly used as a filler. The liquid ingredients are plasticizer for flexibility, a fungicide for protection from mold, UV stabilizers to prevent fading and a blowing agent that’s activated later to form the foam. The liquid and powder parts are combined and mixed for 15 minutes to create liquid foam. Then it’s filtered so no lumps or paper fragments will end up the production line. This is where the liquid foam is evenly spread on a continuous sheet of felt paper backing. After, the coated backing is heated in the oven at 220 degrees Celsius for 15 seconds. During this process the liquid becomes solid and the PVC in the mixture adheres the whole now solid matter to the backing. Next step is to print the design directly on the surface. This is done with a rolling machine that makes it possible to print designs with as much as 6 different colours in one go. The top layer is the so-called wear layer that protects the print from any damage. Made of PVC resins and plasticizer it’s first white but becomes transparent once it’s heated in the oven. It’s during this process that the blowing agent is activated causing the foam to expand. Vinyl flooring can. The desired texture is created using a process called ‘chemical embossing’. The colour contains a chemical inhibitor to suppress expansion wherever it’s applied. When printed this effect of high differences can be used to imitate characteristics of different flooring materials, manmade as well as natural. The glossiness of vinyl depends on the chemical components of the wear layer. Vinyl floors can be a nice addition to any space in your home. With vinyl floors possibilities are endless. Depending on what look you are going for, you can choose more earthly tones, let your floor truly pop with a more colorful palette or even go for an organic look like stone or ceramic tile. If you aren’t necessary hung on having natural flooring at home and are looking for a worthy alternative vinyl might just be the ideal flooring option for you. It’s indisputable that the most admired quality of any vinyl floor regardless its shape and size is its resilient nature. Resilient floors are famous for being firm, yet having a “give or bounce back.” This makes vinyl floors feel pleasantly soft under your feet and contributes to its durability. In fact, resilient floors like vinyl are so much more durable than hard or soft floors that they make the most of the performance surfaces used for dance or athletics. Vinyl being a synthetic material combines a wide range of characteristics that are tailored to our everyday needs. It can withstand liquid spills and stains with an ease. Vinyl flooring is scratch proof to such degree that it’s recognized as the ultimate flooring options for households with pets. Installing a floor that’s incredibly durable but doesn’t offer the support you need in your day to day life would be a true disaster. Luckily, vinyl isn’t one of them. By choosing vinyl flooring you are choosing comfort underfoot. Being mostly made out of rubber, vinyl makes for a soft and pleasurable walking experience. Neither sheet nor tile vinyl floors get affected by the environment much, so they don’t get cold in the winter. Some vinyl floors even come with an extra padded layer for better support and softer feel. Vinyl’s resilience also makes it one of the best noise cancelling flooring materials flooring companies have to offer today. The certain “spring” that vinyl flooring is famous for doesn’t come in handy just for barefoot strolls across the kitchen. More than anything they are helpful to soften the fall which means fewer shards of broken glasses to collect and fewer crying toddlers after an unexpected stumble. Vinyl’s slick surface also doesn’t trap any dust or allergens and can be installed in homes of people who are prone to allergies. Only a few flooring options are as easy to maintain as vinyl. Sweeping dirt away and using a slightly damp mop for stains is all it takes to make your vinyl floor look spotless. For extra stubborn spots, you can use a special cleaner for vinyl flooring. Vinyl floors come in sheets, tiles or plank form giving you every option to find your perfect floor. The patterns are just as diverse. They can brighten the room with their vivid colors or ground it with realistic replicas of real materials like wood or stone. 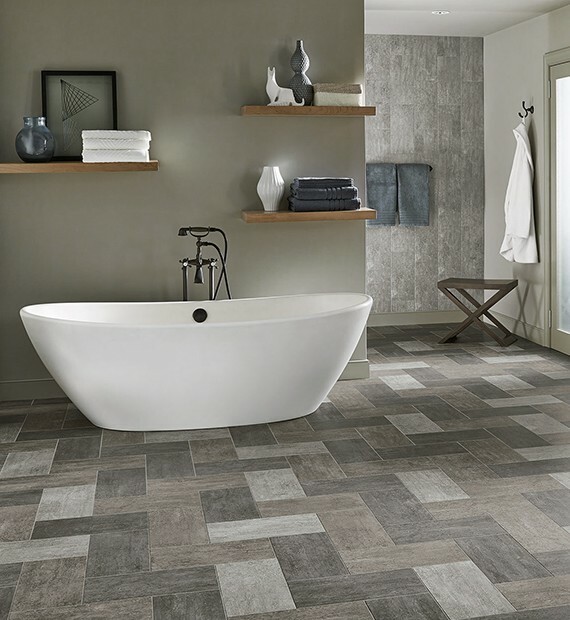 Unlike alternative flooring options, when installing vinyl you have the opportunity to take your imagination one step further and create a unique pattern by mixing different tiles. Vinyl flooring is relatively easy to install as long as you have a completely dry, level subfloor. Usually, the best subfloor is a layer of well-sanded plywood. Vinyl tiles and planks are every DIYers favorite flooring option and that’s for a reason. While vinyl sheet flooring requires the adhesive liquid to be spread evenly on the subfloor surface for the vinyl to get glued down, a process that could potentially get really messy, vinyl flooring tiles and planks come with a self-adhesive backing. All you’ll need to do is to peel off the protective layer and the vinyl is ready to be installed. How much vinyl flooring costs depends on the quality of used material and the design. Still, with prices as cheap as 50 cents and up to $10 per square foot, vinyl manages to remains one of the most affordable flooring options available on the market. Vinyl floor won’t only do your wallet good but will also give you the best flooring experience for the buck. You can’t protect your vinyl floor from wear, after all, it’s there to be walked on. But you can prolong it’s fresh look if you care for it right. Make sure you always read the manufacturer’s instruction on maintaining your vinyl floor or consult a flooring specialist first, in case you want to try something new. For now here are some care tips to keep you vinyl flooring beautiful for years to come. If you want to be able to enjoy your vinyl flooring to the fullest, you need to take extra care the first week following the installation. Avoid rolling heavy objects on your newly installed vinyl floor for at least 5 days. You shouldn’t wash your floor for just as long. For better durability of PVC vinyl flooring, some manufacturers advise applying 2-3 coats of recommended floor polish right after the installation. Applying high pressure on a small area can cause to the foam to flatten out at places. If you have to move extra heavy objects, we recommend you use plywood. For the same reason, consider covering the legs of your furniture with felt leg covers. Placing walk-off mats at every entry point is a smart way to protect your floor from extra dirt, but avoid rugs with rubber backs. Like with any other flooring, spills must be wiped up immediately if you want to avoid spotting. Cleaning your vinyl floor regularly is important. Use only the cleansers the manufacturer recommends and rinse the floor with fresh water after applying a cleaner. Avoid using abrasive scrubbing tools, they might leave scratches on your vinyl floor. Using a vacuum with a beater bar should be avoided for the same reason. Throughout its life, your vinyl floor might require some repairs. If you notice open seams, cover them immediately. In the case of cuts or gauge, keep the area safe while you call your flooring specialist. For many, pets claws are a real deal breaker when deciding on what floor to install. Even though vinyl flooring offers soft enough padding to enjoy walking around barefoot, most scratches and liquid spills don’t faze it. It also stays warm during the winter months and offers a soft support for your four legged family members.